Pros: Good quality, clean cut shows featuring excellent performances across the board and very good designs. Cons: A couple of issues, one being the age of the cast, but generally no complaints. Our Verdict: A great way to spend an evening – excellent quality unpretentious theatre, well worth the ticket price. I like to think that I have a special connection to the Pleasance. Their founder, Christopher Richardson, designed my school theatre; their current Director, Anthony Alderson, went to my school some time before me; in Edinburgh, I practically live in the Dome and the Courtyard; and the first Edinburgh show I produced was in 10 Dome. Despite all of this, in six years of living in London I have never been to the Pleasance Islington. Ridiculous. This double-bill of new plays presents two one-act shows on either side of the interval. Both shows were created by the Old Vic New Voices TS Eliot US/UK Exchange, and have since been workshopped into one-hour long productions. The first, People Like Us by Jake Brunger, is set in a luxurious country house dining area (specifically not the dining room, but rather a cosier, more intimate place in the sprawling house). The plot is clean and without frills: Clemmy has invited her brother Josh and his new girlfriend Sally to join her and husband Tom ostensibly for dinner, but actually to discuss the future of Clemmy and Josh’s jointly owned estate. It describes itself as a ‘comic drama about class, coupling and camembert’, which is pretty much exactly what it is! The performances from all four actors are excellent, which leads to a very engaging hour. The focus is on the dialogue and the delivery of the lines has therefore been honed to perfection by Kirsty Patrick Ward and her actors. There contrast between the characters is also excellent, and makes for some brilliantly awkward moments around the dinner table. The two male characters are truly recognisable; Nicholas Banks plays Tom to perfection as an obnoxious, arrogant and infuriatingly amusing snob, and George Taylor’s portrayal of Josh as a patronising and overly-protective boyfriend and pseudo-liberal will cause you to roll your eyes (in a good way!). 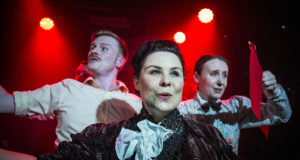 Meanwhile the female performers are also excellent; Samantha Kissin as the watery-eyed Clemmy does elicit a genuine emotional response and Leah Brotherhead as the Essex girl Sally is really the only likeable character on the stage. The only slight weakness is that the young cast are playing characters which I assumed to be a few years their senior. On a couple of occasions therefore, you can’t help but feel like the characters are too young to really have the problems they are discussing on a couple of occasions. Nobody’s fault though – it is what it is, and they do a brilliant job of playing characters older than themselves as a general rule. 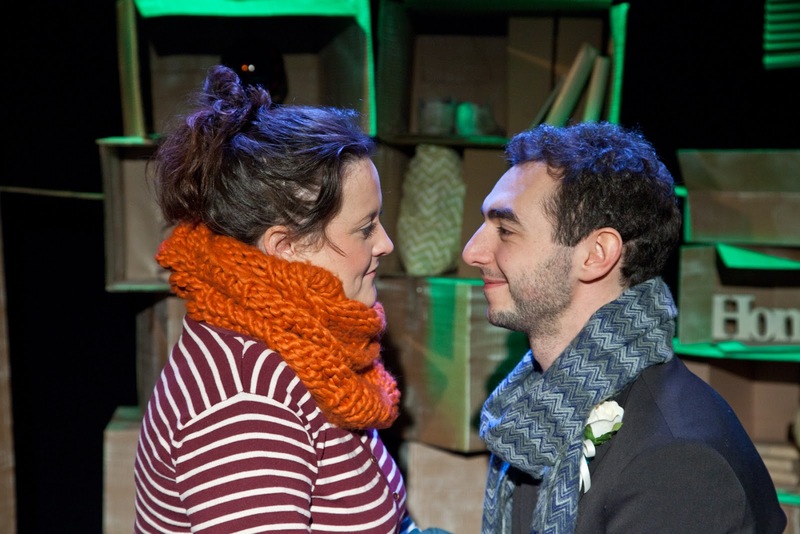 The second show is Happy Never After by Hannah Rodger, which follows the life of young couple Jen and Neil, who have just moved into their first shared flat together. It’s an exploration of issues that spring up and get in the way of love and life; I don’t want to spoil the plot because the suspense is an important part of the viewing experience. Once again the performances were excellent. Jessica Ellis is particularly good as the fun-loving Jen, and her loveable portrayal makes it harder to watch as her life starts to unravel a bit. 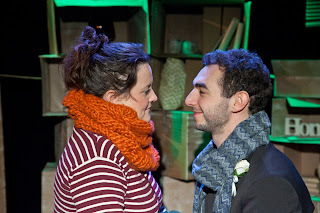 Meanwhile, Liam Mansfield is excellent as the kind-hearted boyfriend Neil as well. My only criticism of the pair of them is that occasionally I had to be reminded by a more physical scene that they are an actual couple rather than just good friends. The design for both shows comes from Gabriella Slade, and these are remarkably good. 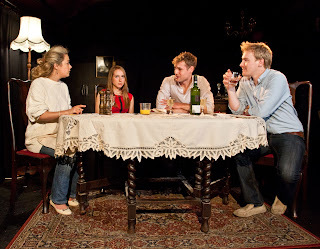 The attention to detail shown in the naturalistic dining room set for People Like Us is really as good as any off-West End production I’ve seen, and in Happy Never After the use of cardboard boxes as furniture was simple and very effective, especially when coupled with some clever lighting. All in all, these were slick, professional, engaging and very enjoyable shows. 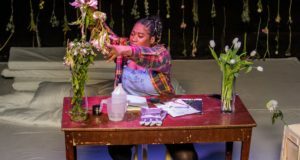 They didn’t require me to think too much, they were unpretentious and easy to ‘get’ and I would recommend them as an excellent way to unwind whilst watching some good-quality theatre from and up-and-coming producer. Finally, my verdict on The Pleasance Islington? Cosy, friendly and generally lovely. Plus, it comes complete with a delightfully friendly black Labrador. People Like Us and Happy Never After runs at the Pleasance Islington until 30th November 2012.